In 2017, Hellabrunn Zoo celebrated another record-breaking attendance year with just under 2.5 million visitors. Highlights of the year include the emergence of the newborn polar bear cub Quintana into the outdoor enclosure for the first time. In July, the zoo held a groundbreaking ceremony for the start of construction work on the new Mühlendorf village at Hellabrunn. The second half of the year saw the completion of renovation work and reopening of the Polar World. Münchener Tierpark Hellabrunn AG looks back on a successful fiscal year 2017 in zoological, commercial and architectural terms. The Chairman of the Supervisory Board, Christine Strobl, took stock of the positive results: "2017 was a thoroughly successful year for Hellabrunn Zoo, both in zoological terms - allowing us to observe the growth of the newborn female polar bear cub Quintana and welcome the return of elephant bull Gajendra to Munich - and in architectural terms with the reopening of the revamped Polar World. The zoo celebrated another record-breaking attendance year with just under 2.5 million visitors." Christine Strobl is also pleased that annual pass sales have risen by 17.3 per cent this year: "An increasing number of our visitors from Munich are choosing to purchase an annual pass. Thanks to the implementation of the Master Plan and high media coverage, Hellabrunn Zoo is gaining popularity as an attractive, modern, peri-urban nature experience. This of course has a positive impact on the number of visitors." Zoo director, Rasem Baban, is clearly satisfied with the results of the past year: "The reopening of the Polar World in September marks the completion of the first of our planned geozones at Hellabrunn. Our visitors are now able to meet land, air and water-based animal species from the polar regions and gain a good impression of natural habitats far away from our city. Last year, we also had a groundbreaking ceremony for the Mühlendorf village at Hellabrunn, representing yet another important milestone in the Master Plan: from summer 2018, the village, which will be the centre of the soon-to-be-established Europe geozone, will educate visitors on regional biodiversity and provide answers to questions such as how wild species became domesticated and why some are threatened with extinction." Baban was also able to give a positive report regarding two further achievements in 2017: "In March, the zoo was awarded the Bavaria Barrier-Free seal by the Free State of Bavaria as a forward-thinking company providing accessibility for all. In August, we were also recognised as a leading attraction by the German National Tourist Board. In a survey of the most popular tourist attractions in Germany, we were ranked 9th in the Top 100 by foreign visitors." In 2017, Hellabrunn Zoo also supported a total of twelve conservation projects, including a reintroduction project for wild Przewalski's horses in Mongolia. The project aims to reintroduce the horses to their native steppes, the Gobi Desert in Mongolia. Last June, the Hellabrunn-born Przewalski mare Naya was one of four wild horses flown to Mongolia to be released into the wild after a three-year acclimatisation period. Thanks to the reintroduction project, the population of this once near-extinct species in the project has grown from 49 in 2010 to 160 in 2017. Hellabrunn Zoo is also actively involved in preserving the local flora and fauna in Bavaria. The nature conservation team at the zoo is dedicated to the protection of domestic animals and plants. In 2017, the zoo installed escape ramps for waterfowl in the Auer Mühlbach river as well as a variety of nest boxes, including for birds and bats. The nature conservation team also implemented strategies to prevent bird collisions within the zoo - such as applying patterns to glass surfaces - particularly as bird collision with glass (windows) is one of the most common causes of death among native birds. "Hellabrunn Zoo's involvement in such a wide range of nature conservation projects is due first and foremost to our dedicated employees as well as our sponsors and donors, who continue to support Hellabrunn year after year," adds Baban. •	Hellabrunn Zoo celebrated another successful financial year in 2017 with a record 2,498,377 visitors. •	Once again, sales of annual passes increased. 61,934 annual passes were sold in 2017, representing an increase of 17.3 per cent. •	As one of the most species-rich zoos in Europe, Hellabrunn Zoo was home to 18,932 animals from 733 species in the financial year 2017. •	The main construction project for the year was the renovation of the Polar World, which opened in September 2017. Features include a completely new pool for the South American sea lions with a modern, underground filter system. There is now also an outdoor enclosure for polar foxes, mountain hare and snowy owls, which visitors can access via a wooden walkway. Other noteworthy construction projects in 2017 included the launch of the first construction phase for the Mühlendorf village, which will be completed in the summer of 2018, a new logistics warehouse, the revamping of the islands in the World of Small Monkeys and the Mangrove World exhibit in the Jungle Pavilion. •	The polar bear cub born at the zoo in autumn 2016 was not only given the name Quintana in 2017, she also became an ambassador of the ProSieben sustainability brand Green Seven: Save the Ice. New births at the zoo in 2017 included offspring for the endangered orangutans and drills. In the case of the latter, it is estimated that there are now only 3,500 individuals left in the wild in West Africa. The zoo also welcomed births for the Humboldt penguins, red river hogs, elks, wood bison, swamp wallabies, eland antelopes, black-headed spider monkeys, flamingos, dama gazelle and Mishmi takins. •	After the completion of the work on the Elephant House, the elephant bull Gajendra was able to return to Munich in March 2017. Other new additions include meerkats, giraffes, vicuñas, yaks, a fishing cat and a red panda. •	Since 2017, the following new species have arrived at Hellabrunn: With the opening of the Polar World, snowy owls and mountain hare moved into the new facilities. In addition, two Pallas's cats have been living in the former leopard enclosure since May 2017. Hellabrunn is a member of the Pallas's cat International Conversation Alliance (PICA), which is committed to the research of the little known wild cat species. Other new residents at Hellabrunn include the Visayan warty pigs and four golden jackals. Visitors have also been able to meet three male moustached guenons, who arrived at Hellabrunn at the end of 2016, but have only been on view in the Jungle Pavilion since the beginning of 2017. 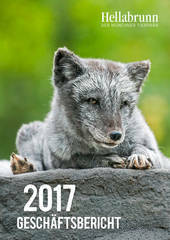 •	The zoo was able to increase the number of tours and seminars provided in 2017. There were 356 Meet Your Favourite Animal adventures, 494 guided tours and 633 children's birthday parties. In total, around 15,000 visitors participated in the guided tours offered by the zoo. •	In the fiscal year 2017, Hellabrunn Zoo featured a total of 5,877 times in the print, online, TV and radio media. •	The number of "likes" on Hellabrunn Zoo Facebook site increased by about 20 per cent from 40,009 to 48,043. At the end of 2017, the YouTube channel had 1,500 subscribers. At the beginning of February, the zoo joined the social network Instagram, and by the end of the year had already gained 2,328 Instagram followers. •	Hellabrunn Zoo published three print products during the year: the publication Hellabrunn Magazin, a detailed zoo guide specially created for Hellabrunn and the very popular annual Hellabrunn Zoo calendar. •	In July 2017, a new website was launched: Atze.online provides information on species conservation and biodiversity at Hellabrunn Zoo. •	Last but not least, in a survey conducted by the German National Tourist Board, Hellabrunn Zoo ranked the 9th most popular tourist attraction in Germany.